Influenster is a popular reviewing site and app that allows bloggers, ‘YouTubers’, and well… influencers to share their thoughts on products as well as ask questions and read other people’s reviews. As for a VoxBox, these are boxes that contain complimentary products to be tested and reviewed. They are sent out to those who completed a survey received via email and have a good impact score. Often you will find the box is catered to your skin type, hair type and colour as well as genuine interest and product preferences. As you can imagine, this is a dream app for bloggers! I got an email at the end of September asking me to fill out the pre-survey as I had been short-listed to receive one of the next VoxBoxes. I remember thinking there is no way I’m going to receive it, it’s my first time filling out the survey, but to my surprise, two days later the postwoman was standing at my door handing over my first ever VoxBox! 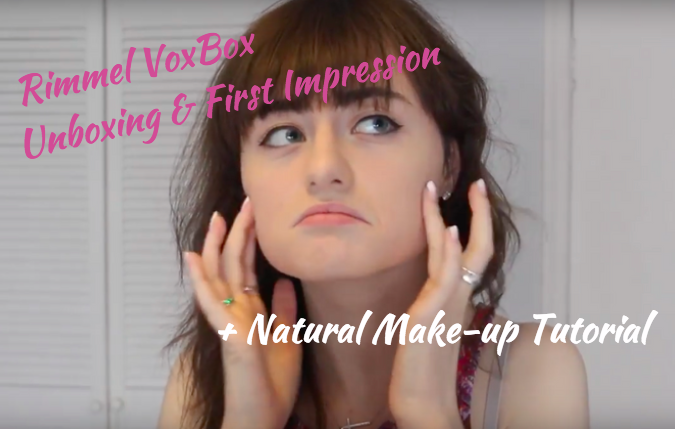 This particular VoxBox contained a number of Rimmel London products, focused mainly around the newly released Lasting Finish Breathable Foundation and concealer. It also came with the Kate Moss Moss Sculpting Palette and a Moisture Renew lipstick thrown in to finish off the look. Please note: All products reviewed in this video were sent to me complimentary. I only recommend products or services I try personally and believe my readers / viewers will enjoy. All opinions are my own.